The Rolling Plan concept in national planning was introduced by the Janata Party Government. The Plan consists of three kinds of plans that were proposed. The First Plan is for the present year which comprises the annual budget and Second is a plan for a fixed number of years, which may be 3, 4 or 5 years. Plan number two is kept changing as per the requirements of the Indian economy. The Third Plan is a perspective plan which is for long terms i.e. for 10, 15 or 20 years. The Fifth Five-Year Plan emphasized stress on employment, poverty alleviation and justice. The plan also focused on self-reliance in agricultural production and defence. Later, it was rejected by the newly elected Morarji Desai government in 1978. The Electricity Supply Act was amended in 1975, which enabled the central government to enter into power generation and transmission. Which of the following is NOT a constitutional organ? The Planning Commission was established in March 1950 by an executive resolution of the Government of India, on the recommendation of the Advisory Planning Board constituted in 1946, under the chairman of K C Neogi. Thus the Planning Commission is neither constitutional nor a statutory body. It is a non-constitutional (not created by the Constitution) and a non-statutory body (not created by an act of Parliament). In India, it is the supreme organ of planning for social and economic development. It is not responsible for taking and implementing decisions. This responsibility rests with the Central and State governments. The Planning Commission is only a staff agency- an advisory body and has no executive responsibility. The Rolling Plan for backward countries was suggested by Gunnar Myrdal. 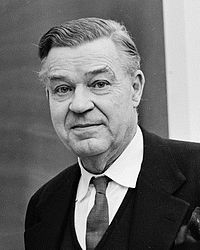 Gunnar Myrdal was a Swedish Nobel laureate economist, sociologist, and politician. In 1974, he received the Nobel Memorial Prize in Economic Sciences with Friedrich Hayek for their pioneering work in the theory of money and economic fluctuations and for their penetrating analysis of the interdependence of economic, social and institutional phenomena. Which one of the following statement is NOT true? Prime Minister is the Chairman of the Planning Commission of India. The National Development Council is presided over by the Prime Minister of India. Secretary of the Planning Commission is also the Secretary of the National Development Council. Planning Commission is the highest decision-making body for planning in India. National Development Council (NDC) is the highest decision-making body for planning in India while Planning Commission is an extra-constitutional and non-statutory body. Hence, the optioin A is correct.